The Bero web site describes Chef Matt Kantor’s food as “modernist re-interpretations of Spanish and Mediterranean cooking,” a promise that has misled some into expecting ElBulli-style molecular metamorphoses; and while bero means “heat” in Euskara, the language of the Basque people, this isn’t Mugaritz either. It’s really much more sensible to visit a new restaurant without any preconceptions at all, especially when the chef does not have a long local track record (I never went to any of Kantor’s Secret Pickle supper club events). And though I had a decent sandwich and soup for lunch once at Commissary (this location’s previous incarnation – two out of three of the same owners), that memory is equally irrelevant. The little room is more attractive than it was. Yes, there are moments of open brick and barn board, but they read as urban domestic, not hipster grunge. The ambience feels more like someone’s dining room, with gentle lighting, a shelf of books and comfortable, well-padded chairs. High stools at the long wooden bar also look inviting – somewhere to sit and explore the list of interesting cocktails (a temptation we resisted this time). Service was friendly, attentive and knowledgeable and though Chef Kantor was not in the kitchen this night and therefore unable to describe his creations as they were brought to the table, our server did an admirable job. As did chef de cuisine, Chris Scott, whose cv includes L.A.B., URSA and Acadia. 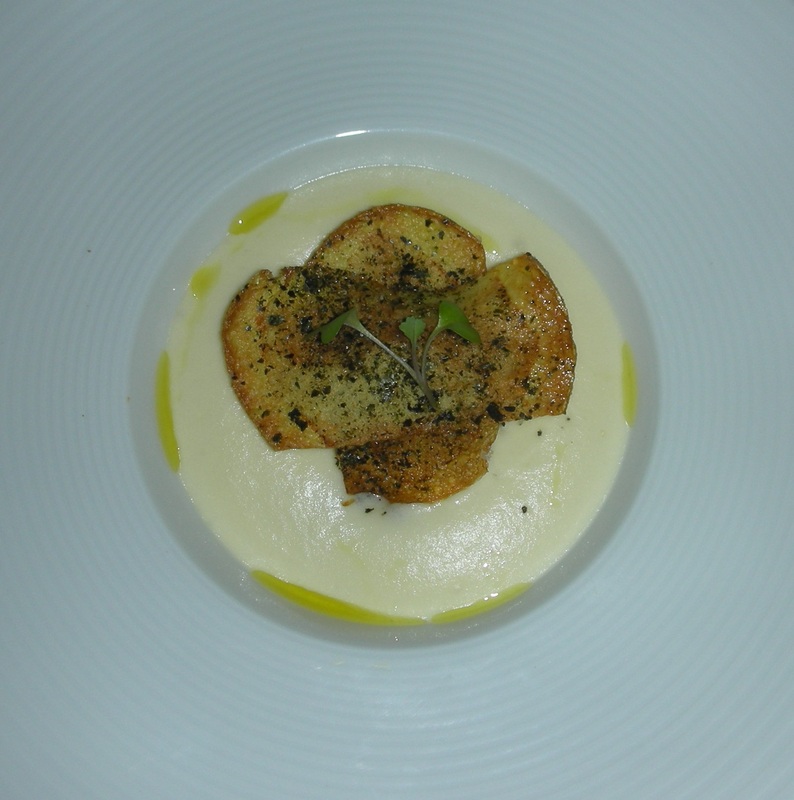 A succession of sophisticated, accomplished, surprising and, above all, delicious dishes emerged from the kitchen. Sometimes, when a chef decides to be unusual or avant garde, the results are pretentious or chi-chi – not when the thinking behind the food is as coherent and the execution as confident as we experienced at Bero. There is no à la carte – just two tasting menus, one of seven dishes ($98 + $63 for wine pairings), the other of four ($68 + $36 for wine pairings). If you choose the latter option, you have a mix-and-match choice of three dishes for each course, a polite way of giving the customer a measure of control. I began with a dish minimally described on the menu as “hen egg – lamb neck – potato – nori.” The components filled the small, deep bowl of a broad-rimmed soup plate. Two crisp, nori-dusted potato chips formed a broad cross that hid a poached hen egg, its runny yolk barely contained by the just-set pouch of albumen. Beneath the egg was the braised, pulled lamb neck meat, rich, sweet and extraordinarily moist and tender. But one had to dig to find it for the lamb and the egg were all but buried in silky whipped potato. The bursting of the egg yolk was the key that unlocked the door to the riches – gorgeous soft textures offset by the potato crisps. Imagine a marriage of oeuf en cocotte and a very high-end shepherd’s pie… Quite the appetizer. An ounce or two of Tawse Riesling cut through everything like an acidic scalpel. 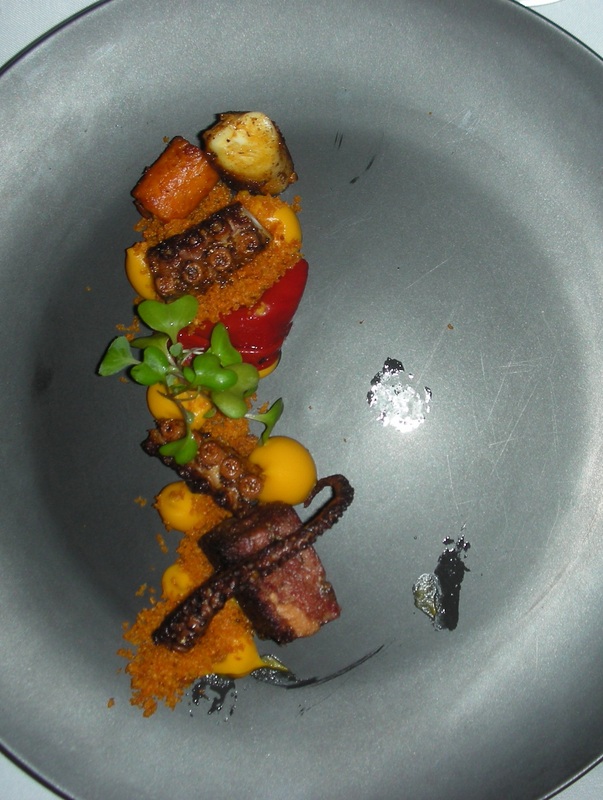 My second dish (“octopus – sweet potato – piquillo – pork”) was equally successful. The grilled octopus tentacle was tender and juicy at its plumpest diameter, tapering to crispness. A salty chunk of braised pig face, its surface nicely caramelized, turned out to be as unctuously soft as a terrine. A single slice of sweet piquillo pepper refreshed the protein, its simplicity subtly pointing up the dramatic transformations imposed on the sweet potato. Here it appeared as a purée, barely spiked with something that might have been mustard. There it was turned into powdery crumble. At the north and south of the beautiful presentation it showed up disguised as a piece of roasted carrot. Sure, it was all very clever, but also meaningful on the palate and a textural tour de force. The suggested wine, Viña Cartín 2012 Albariño, was a fine choice, with refreshing acidity but enough stone-fruit fragrance to harmonize with the piquillo and the sweet potato. At this point the kitchen sent out an extra dish to all four of us – a single, supple tortellino stuffed with a spicy farce made from lamb neck and shoulder, seasoned with paprika and a hint of garlic. Four slices of black truffle worked their way in among the flavours while an intensely lamby reduction showed off the kitchen’s mastery of a classic demi-glace. The aromatic oak and weight of Flat Rock Chardonnay was an inspired match. 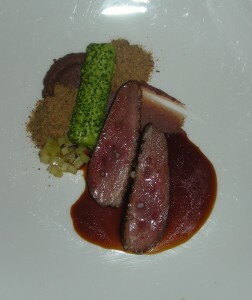 Duck came next – two thick, tasty, sapid slices of red breast. My mother always served “sand” with roasted game birds – fine bread crumbs finished in the oven that picked up fat and juices on the plate in a most delectable way. Here, the kitchen adds two little mounds of rye crumbs to this dish to a similar effect. I thought I tasted caraway in the crumbs, but it may just have been the flavour of rye. There were other little gustatory ghosts on the dish – like harmonics from unplucked guitar strings: I’d swear I tasted dill on the tube of soft broccoli mousse. I only know one chef who has ever made magic from broccoli stalks – Susur Lee in his Lotus days. Here they had been cut into a brunoise and lightly pickled, a good condiment for the duck and a dazzling contrast to the dish’s final component, a soft, earthy purée of morcilla blood sausage. Malivoire’s 2012 Small Lot Gamay was a precisely judged match. Given the kitchen’s meticulous care for detail and talent for presentation, dessert was always going to be interesting. Unexpectedly, it was the least dainty of all the dishes, centred with a thin, biscuitty tart shell filled with a dense, sticky purée of Asian pear. Chunks of sherry-soaked financier cake and a quenelle of earl grey ice cream shared the plate which was finished with a squiggly extrusion of white mascarpone. They offer a second dessert at Bero, should one be required, or there is a cheese option (a very small amount of cheese for a $12 add-on). Instead, you would be advised to wait for the mignardises – wobbly, sugar-crusted negroni jellies, melt-in-the-mouth chocolate brownies and salted caramel squares on the night we were there. Bero meets so many of the criteria I cherish in a small restaurant – excellent service, a relaxed ambience, basic comforts, interesting drinks and food from a chef with a personal vision and the technical skills to back it up. There’s really no need to try to categorize it much beyond saying it’s proudly contemporary and gastronomically fascinating. None of us had a dish that failed to please, though the menu changes often enough, I gather, that regular customers will be guaranteed new adventures. Next time I go, I’ll fork out the necessary pair of C-notes for the 7-course dinner with drinks and tip. That’s pricey for Leslieville, but not for the quality provided at Bero. Open for dinner only, Wednesday through Saturday, Bero is at 889 Queen Street East (on the south east corner with Logan). 416 477 3393. www.bero-restaurant.com.